JUOZAS PIVORIŪNAS, presently of Cleveland, Ohio, is a graduate of Ecole des Arts et Metiers (Freiburg). He is the author of a critical study of Čiurlionis in Lithuanian language. Of the great individualistą of the new epoch, Čiurlionis must be given a foremost place. He must be understood and appreciated not only for the mystic and seer that he was, but also for his unique aesthetic and pictorial ideas. Everybody seems to agree that the Lithuanian painter and composer M. K. Čiurlionis (1875-1911) was a great artist. 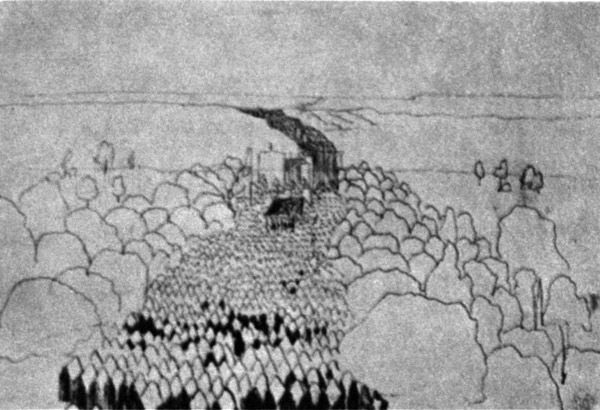 Some have gone even so far as to ascribe to him the role of the father of modern abstract art, others have claimed that he aimed to achieve the synthesis of art and music in his paintings.1 Indeed, Čiurlionis' art is so unique and individualist that it is difficult to classify and interpret it. The question of his place in art history appears to be gaining importance at the time when his 90th birthday is being commemorated. Perhaps this is as good an occasion as any to consider the meaning of Čiurlionis again. The American art historian and critic George M. A. Hanfmann, one of the few Westerners who saw the original paintings of Čiurlionis, has written that "The life of Čiurlionis would make a fine novel, a psychological novel au far with the drama of Van Gogh." 2 However, the fact is that to write an article on Čiurlionis is not a thankful task in all respects. His works were never exhibited beyond the boundaries of Lithuania, Poland and Russia, and at the moment are not available to the western world, thus the artist himself is almost wholly unknown here. Presently in Lithuania Soviet historians and art critics are attempting to evaluate his art in the light of Marxism-Leninism, with which his works had nothing in common. Meanwhile, to his fellow nationals in the West Čiurlionis is gradually becoming a legendary figure. If his musical works were immediately accepted more or less equally by all, his paintings became an object of the most varied interpretations and even, one could say, a source of fantasies. Thus the story of Mikalojus Konstantinas Čiurlionis, which began on September 22, 1875, in the family of a poor organist in a small town in Southern Lithuania, lacks a happy ending. Having noted the musical abilities of his eldest son at an early age, his father began training him. With the help of well-to-do patrons young Mikalojus entered the Warsaw Conservatory, from which he graduated in 1900. Declining the post of director of the Lublin School of Music offered to him, he made his living by giving private lessons in Warsaw, and composed. His symphonic poem Miške (In the Forest), composed about that time, was honored with a contest award, but his various works for the piano are considered his most important compositions of that period. In 1902 Čiurlionis left for advanced studies at Leipzig conservatory. "I very much want another kind of life. I have done much work, and that accompanied by misery," he wrote to his father. These words are aptly typical not only of the days of his studies at Leipzig, but to all of his later life as well. In the German atmosphere Čiurlionis felt alien and lonely. His letters reveal that he longed not only for his parents, brothers, sisters and friends, but also for the beautiful countryside of Druskininkai, which he began trying to paint from memory while in Leipzig. Druskininkai, a small resort town in Lithuania. was the most permanent place of residence, where Čiurlionis' large family lived and where he returned to spend almost all of his vacations. While still a music student he liked to wonder through the beautiful environs of Druskininkai and to make sketches. It seems that it was here that Čiurlionis created more of his paintings than anywhere else. Čiurlionis! The name brings back all my childhood! I was seeing him, passing like a shadow always in deep thoughts. And I was dreaming to be like him. I knew that he was a painter, that he was a musician, I knew all his family. I knew his father, the organist of the church, whom I questioned often about his son, not daring to approach Čiurlionis himself, always so withdrawn. The father would advise me not to follow the example of his son, that would not lead to any good for me. I was often in his house on the shore of the lake Druskonė where my father had build a beautiful house for one of the notables of our town. I saw the paintings of Čiurlionis which fascinated me, I was too young to really appreciate them. Now I remember that I liked very much his Lithuanian cemeteries, so full with mystery. Concerning his dream about the synthesis of all arts, I think that his dream was realized in the great temples, cathedrals and palaces, where what is due to the eye belongs to the domain of the eye, and what is due to the ear belongs to the ear, but together form the majestic accord which is the real synthesis of the arts. What is certain is that Čiurlionis was a real genius. And I am proud to have been born in the village whose ground were touched by his footsteps. Our dear, our unforgetable Druskininkai! Let us return to Čiurlionis and his music studies in Leipzig. In Leipzig he wrote little pieces for the piano, an overture with'Lithuanian motifs, a fugue for a string orchestra and a string quartet (part of these works were lost during World War I). He graduated from the Leipzig Conservatory in 1902 and a little later again settled in Warsaw, making a living as teacher. Taking active part in the city's musical life, he had begun painting quite seriously. In the early part of 1904 he enrolled in the Warsaw School of Art (earlier he had studied for a short time in the Kauzik Art School), where he soon attracted the attention of the students and the teachers with the richness of his imagination and the originality of his creations. There occurred a significant turnabout in Čiurlionis' life: painting took over the fundameptal role and he devoted most of his time and energy to it. Music, it is true, remained an important and attractive field for him, but he no longer found much time for composing, although he had numerous plans in mind. Indeed, his later musical compositions are considered among his best, however, there are only a few of them extant (some were lost during the war). 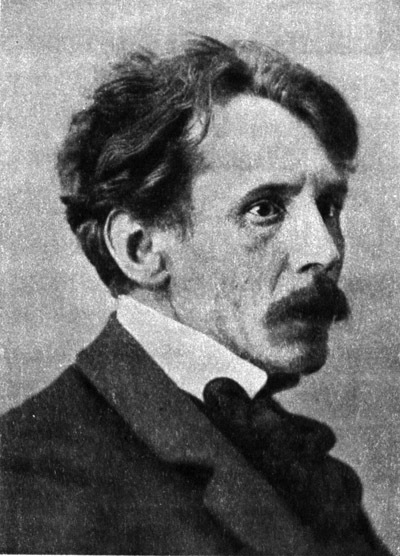 The most substantial of his works — the symphonic poem Jūra (The Sea), composed during 1904-1907 — belongs to this period. It should be remarked here that even earlier Čiurlionis was not entirely satisfied with music only. During his study years in Warsaw he delved into natural science and history as much as was possible. He was drawn particularly to the questions of astronomy and cosmography, read all of the popular works of the French astronomer Flammarion, and was interested in the philosophies of Kant and Nietzsche. Among the many authors he apparently favored Hoffmann, Dostoevski and Poe. Nevertheless, once he became immersed in painting, it seems that he did not find much time for other endeavors. When Čiurlionis' health began failing in the summer of 1905 his good friends provided him with a vacation in the Caucasus, where the grand scenic splendor made an unusual impression upon him, and he wasted no time in returning with an urgent passion to paint. In his travels through the major cities of Europe during the summer of 1906 Čiurlionis visited art museums, galleries and churches until he was totally exhausted. He was fascinated by the ancient cities and buildings, and the art of the old masters. He stayed a bit longer in Prague, Dresden, Nuernberg and Munich, and arived in Vienna so tired that he had to forego energy-sapping tours. In 1907 Čiurlionis settled in Vilnius and participated very actively in Lithuanian cultural life. He directed a chorus, arranged Lithuanian folk songs, wrote articles on music, and organized the Lithuanian Art Society and Lithuanian art exhibits. His own paintings did not meet with great success, however, since they appeared far too modern and incomprehensible to the general public. In the fall of 1907 Čiurlionis moved to St. Petersburg. There too was the same national cultural activity, the same material need and the same passion for painting. Musical composition, meanwhile, was in his plans for the future. While in St. Petersburg, Čiurlionis became acquainted with the progressive Russian artists, participated in the exhibits of various groups, and was enthusiastically accepted by the most serious critics of those days. The future looked bright. But serious illness struck Čiurlionis at the end of 1909. He died on April 19, 1911, and was burried in Vilnius. According to available data, Čiurlionis left about 250 paintings. 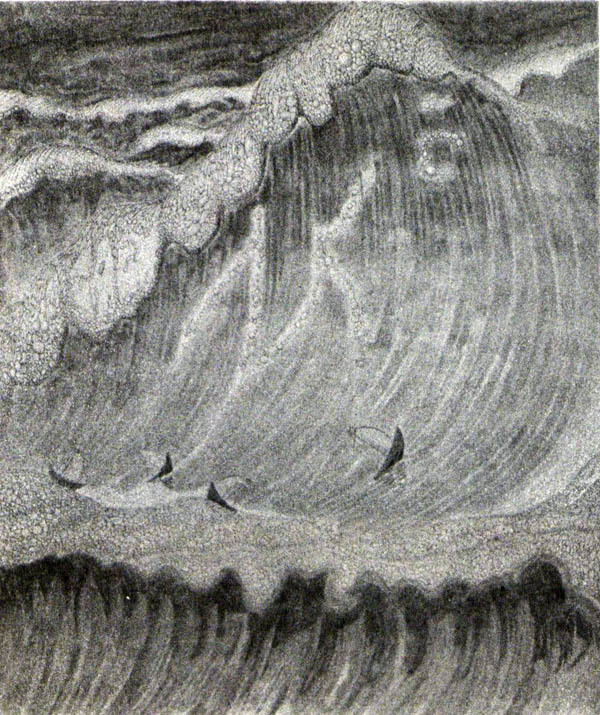 The number of his known works, including graphic art, drawings and sketches, is well over three hundred. Not long after Čiurlionis' death an exhibit of all his works was held in Vilnius. At the end of 1911 the asociation of progressive Russian artists Mir Iskusstva (The World of Art) arranged to have part of this show (158 pieces) taken to Moscow, then at the beginning of the next year to St. Petersburg. In April, under the sponsorship of Mir Iskusstva and the art journal Apollon an impressive commemoration of Čiurlionis was held in the St. Petersburg Conservatory. One 1914 issue of Apollon was devoted to his works, with reproductions of many of them. Everyone was so impressed with Čiurlionis' works that it was decided right there and then to invite him to take part in the 'Salon' show. 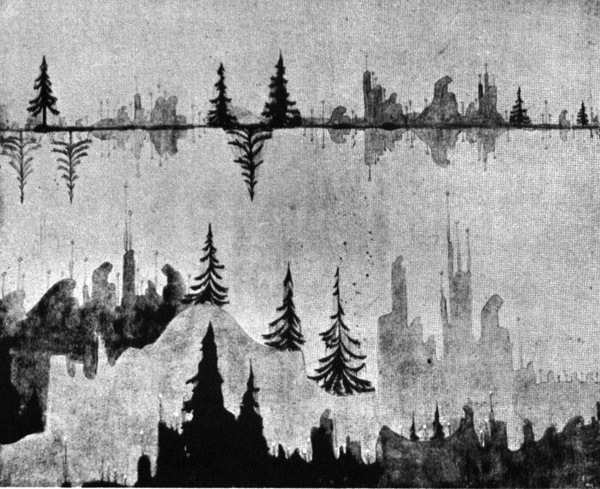 First of all, Čiurlionis' works amazed everyone by their originality and uniqueness — there was nothing else like it — and the source of his art appeared profound and mysterious. 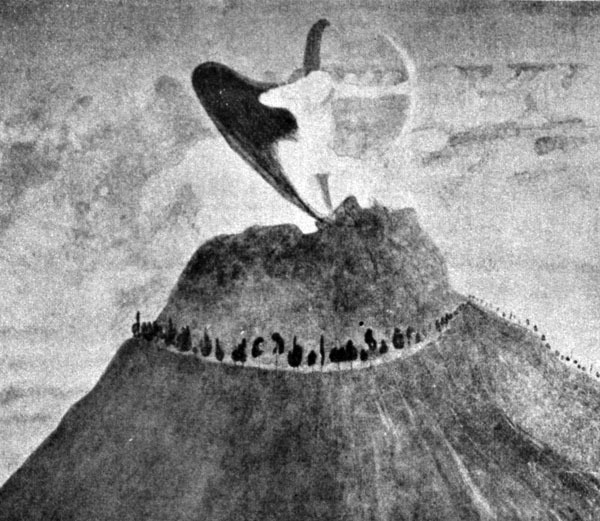 There would come to mind a comparison... with William Blake and Odilon Redon, artists whom Čiurlionis could have known, but whether he did know them and whether they influenced him is a question which has still to be answered. That Čiurlionis' art was replete with Lithuanian national motifs was clear, but his mystique, all that which hides behind his musical 'programs,' his ability to look into the world without limit, into the depth: he went far beyond the narow-national bounds. What truly pleased us in Čiurlionis' works and pleased us like some rare discovery, was his sincerity, his genuine mystique and his deep spiritual content. If in some of his works Čiurlionis is not wholly a 'master,' occasionally timid and seemingly technically helpless, in our eyes this was not a negative trait of his works. On the contrary, his pastels and temperas, painted with the light touch of a musician, and sometimes as though childishly naively, without any 'recipe' and without any mannerism, occasionally 'don't know how,' as though born spontaneously, by their grace and fragility, their coloration and composition appeared to us like some kind of gems. To us their musical titles seemed more of a curiosity, that side of his art which is not the main element in its evaluation. Čiurlionis brought with him (i.e., to St. Petersburg — J.P.) relatively few of his first compositions (pastels); it seems to me that having matured in his art he did not very much care for them, and to all of us, I recall, their boldly emphasized symbolism then appeared too literary. No doubt this is neither a precise nor an in-depth discussion of Čiurlionis' art. Still, not all of its interpreters are able to come closer to it; to approach it as directly and ordinarily as this friend of Čiurlionis in his St. Petersburg period. Dobuzhinski's mention of a possible Blake and Redon influence has not been determined. However, it is truly difficult to see a direct relationship between them, or even a substantial similarity between their works and Čiurlionis' paintings. A comparison may sometime be made because all three of them were more or less romanticists, mystics and symbolists; then, too, they were genuine individualists, difficult to classify or compare with others. There is reason to believe that Boecklin, Stuck, Klinger and Munch had (or at least could have had) an early influence upon Čiurlionis. Some of his pieces quite clearly reflect his interest in Jugendstil or Art Nouveau, and even Japanese art. Čiurlionis might even have found creative impulse for his painting in the art of the later Middle Ages and the Renaissance period, particularly German and Flemish art. Various influences were a natural and inevitable experiences, as they are to every developing or even mature artist. And Čiurlionis was influenced not just by the art of various lands and ages. Many other factors predetermined in their own way the character of his creations. There is no reson to doubt that appropriate impressions were left by life under Tsarist oppression, the literature he had read, the musical studies, an extraordinarily deep love of nature and his native land, and certainly by many other facts. Likewise, we should not ignore the Warsaw Art School, even though the ordinary interpretation of this question goes something like this: Čiurlionis soon realized that what he yearned to express could not be learned in school; he therefore terminated his studies and forever remained a genial self-educated man. Still and all, he studied in that school about two and one-half years (not counting the attendance at the Kauzik School of Art) even though, it now appears, he was not at all times an example of diligence. The newly-established school may not have been rich in many teaching devices, but there certainly was no lack of young enthusiasm, democratic atmosphere and an open mind for the new. Čiurlionis' talent was soon noted and appreciated in a special manner: the heads of the school decided to grant him a complete creative freedom with the privilege of utilizing the technical advice of the teachers. In addition, the director of the school provided him with separate quarters where he was able to work unrestrictedly and without interruption. 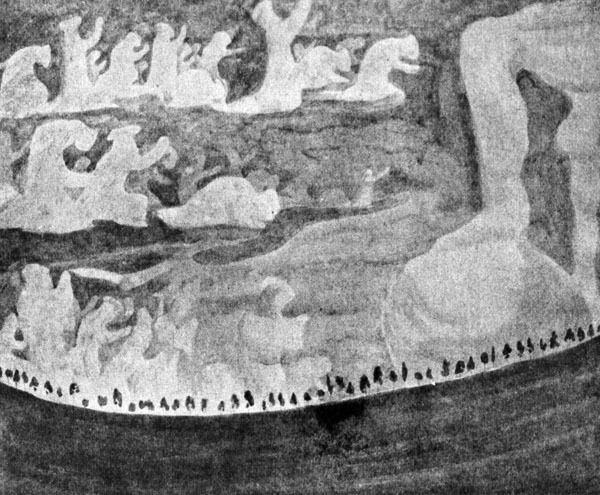 At the exhibit of the school's works, held in St. Petersburg in 1905, Čiurlionis made his first debut into "the wide world." The Russian critics noted his paintings and commented very favorably about them. It would seem too bold to say that all this meant nothing to Čiurlionis and did not in the least affect him. If, for example, instead of sending him to study music at Leipzig his patron had installed him conveniently at the Ecole des Beaux-Arts in Paris or the London Royal Academy, it is not known what the results of his studies would have been then, but it is likely they would not have been altogether the same. The painter Čiurlionis used much valuable time on his musical studies. True, music later compensated him in its own way, but who can say whether this was sufficient. Nobody doubts that the long musical experience (he had studied it from childhood) had meaning for his paintings. A certain relationship with music can be seen not only in the musical titles of some of his paintings (preludes, fugues, sonatas. . .) but in the paintings themselves. It can be observed that he used a new type of composition in them, analogous to the composing of music, attempting to rely on some principle of musical composition. 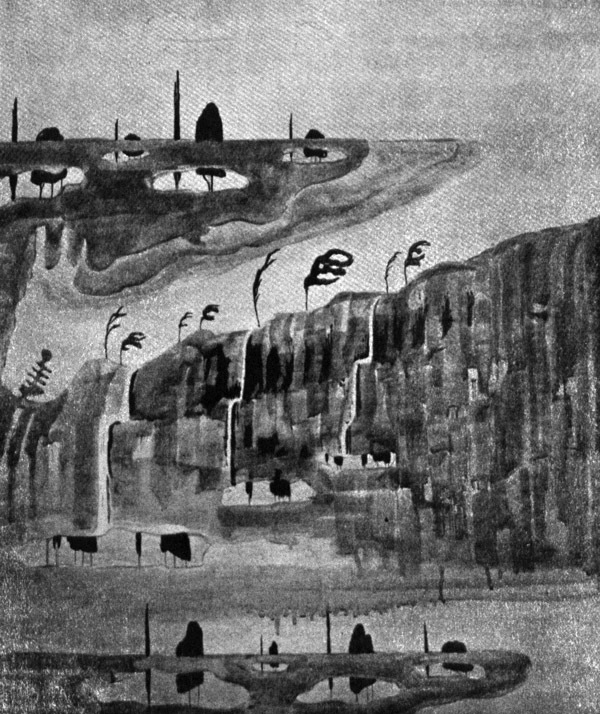 If it is said that "Seurat and Gauguin Į>erceived analogies between music and painting: Kandinsky and Klee sought a meeting ground between the two," 4 then we may suppose that Čiurlionis practically exploited music for painting. For this reason it is not astonishing that some people tried to discuss the problem of the synthesis of arts in connection with his paintings, or even to seek in his paintings the very synthesis of music and painting. Another circumstance explaining these efforts was the fact that the question of such synthesis, or that of time and space in general, was very much the fashion in those days. Nevertheless, Čiurlionis was not a theoretician of art, he did not proclaim his ideas on any questions of art, and even disliked interpreting his own works. There is not even the slightest mention of any synthesis in his collected letters, and living witnesses never even mentioned anything of the sort. There is no basis for thinking, therefore, that Čiurlionis ever seriously and conscientiously sought for the synthesis of music and painting or time and space. In his carefully prepared article Vytautas Kairiūkštis considered quite extensively the relationship of painting and music in Čiurlionis' works;5 as did Nikolaj Worobiow in his work 6 At that time Čiurlionis' immediate relatives (his wife, brothers, sisters) and former friends were readily available for supplementary information. Both of the cited authors acknowledged the importance of music in Čiurlionis' painting and both clearly emphasized that Čiurlionis did not strive for such an impossible thing as a synthesis of music and painting. And there were no dissenting reactions to this opinion. However, some years ago art critic Aleksis Rannit contended that Čiurlionis had wanted to paint music and had sought a complete synthesis of time and space in his painting.7 Unfortunately, he provided no substantiation for such a statement. At the same time A. Rannit touched upon the question of the genesis of abstract art, with the explanation that the honor of discovering abstract art (in the present-day sense of the word) belongs to Čiurlionis, and not Kandinsky, whom Rannit considers to be a follower of Čiurlionis. Rannit presents this text, appropriately "modified", as a reliable source upon which he bases his contentions. However, the information in the encyclopedia article is so misleading that it is truly difficult to believe that its author (Charmion Wiegand) was acquainted with Čiurlionis' paintings. In the first place, Čiurlionis never abandoned content and did not leave a single painting which could be called non-objective or non-representational art. Then too, it is not correct to consider all or most of his work plastically weak. There are such, of course (we see in Čiurlionis' letters that he himself was not satisfied with all of his paintings) but which great master had ever been able to avoid weak results in his creative endeavors ? Čiurlionis can hardly be associated with painters of the non-objective school. Rannit's contention that Kandinsky began painting his abstract paintings influenced by Čiurlionis remains unproven and must, therefore, even in the best circumstances, be considered only a premise for the support of which it is doubtful whether a factual basis will ever be found. 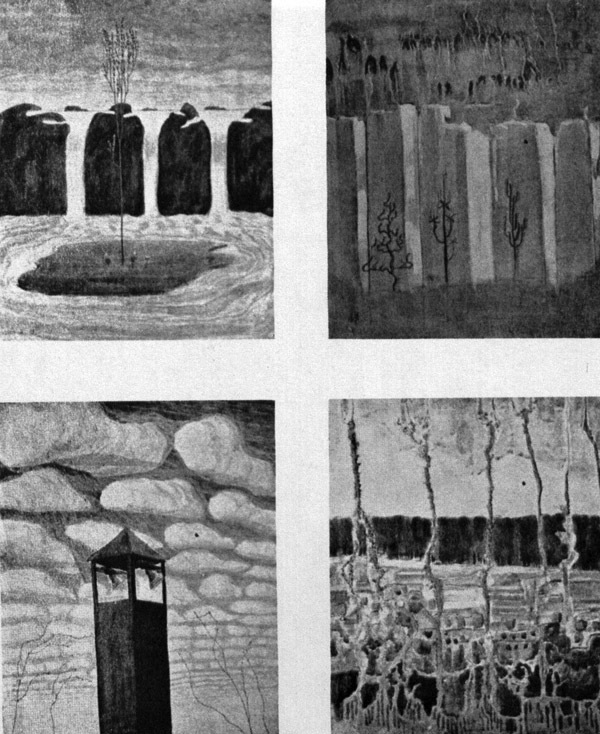 True, in Čiurlionis' paintings there are some anticipations of abstract art, and also of surrealism; but he did not consciously prepare the field for one or the other. He was neither a theoretician nor a formal experimentalist. He did not practice abstract art as such and, we may surmise, did not see or foresee it in his works, since he did not try at all to develop it consistently, and in a certain sense it was coincidential matter in his paintings. It would be incorrect to believe that abstract elements came to Čiurlionis as he rallied his musical experience to the aid of his paintings. They were rather evoked by the unique themes of his creations, while the practice of musical composition played only the part of a more or less important assistant which, understandably, cannot be ignored. Such deductions or premises are encouraged by the fact that it is difficult to portray definitely the content of all those paintings of Čiurlionis that might be related to abstract painting. We first meet his "abstracts" in the thirteen painting cycle "Creation of the World," painted in 1904-1905. Some of these pictures are similar to abstract paintings. Yet, with what real models could such periods of the creation of the world be illustrated, when in the totally void space the basic elements of the universe were barely emerging? He returned to a similar theme, but with more refined painting, in 1908, in his unfinished two-part "Sonata of the Stars" (or "Sonata of Chaos"), in which the idea of the creation of the universe determined the results of the work that could be associated with abstractionism. It seems there would be some basis to seek for a certain spiritual tie between the great individualists — Klee and Čiurlionis — although their ways of life are different and their art also shows no direct similarity. Still it is not simple to find an appropriate place for Čiurlionis in the history of art. It is fairly safe to maintain that the painter Čiurlionis remained free of influence from the impressionistic "science", which had set in motion the arts by introducing the tradition of experimentation and by creating a kind of competition among the more or less significant schools — a competition which in the contemporary world manifests frequently in the phenomena of chaos, cultural atrophy, egocentrism, and sensationalism in art. In sight of such phenomena we are often tempted to consider the progressive twentieth century painter Čiurlionis as a representative of the past century, in which, paradoxically, he was so clearly out of place. 1 Such and other views have been expressed by a number of noted critics. See the special issue of Lituanus (1961, No. 2), dedicated entirely to Čiurlionis. 2 The Art Bulletin, Vol. XXI, No. 2 (June 1939), p. 206. Hanf-mann here is reviewing the book on Čiurlionis by Nikolai Worobiow (see note 6). Hanfmann at the same time provides biographical data on Čiurlionis and reviews his painting. Hanfmann's review must be considered one of the best English language articles on Čiurlionis. 3 M. Dobužinskis, "Mano atsiminimai apie Čiurlionį" (Memoirs of Č. ), in P. Galaunė, ed, M. K. Čiurlionis (Kaunas, 1938), p. 94. 4 Alfred Neumeyer, The Search for Meaning in Modern Art (Englewood Cliffs, N.J., 1964), p. 120. 5 Vytautas Kairiūkštis, "M. K. Čiurlionies tapybos kūryba" (The Art of C.), in P. Galaunė, op. cit., pp. 35-40. 6 Nikolaj Worobiow, M. K. Čiurlionis, der litauische Maler und Musiker (Kaunas-Leipzig, 1938), pp. 30-47. 7 Aleksis Rannit, M. K. Čiurlionit, pionnier de l'art abitrait (Paris, 1949), pp. not given. A slightly changed version of this publication is Rannit's article "M. K. Čiurlionis, the First Abstract Painter in Modern Times", in Lituanus, September 1957, pp. 15-21. 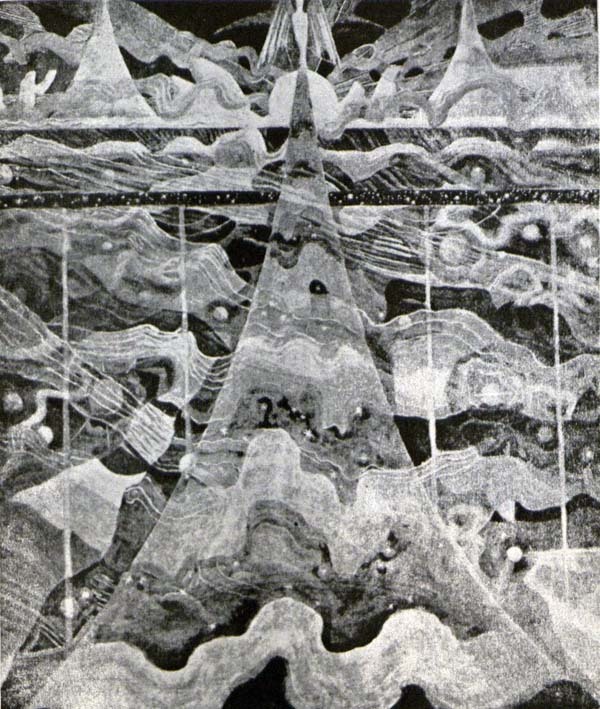 The same ideas, only with some modification, are repeated by Rannit in the article "Čiurlionis Seen as Symbolist", Lituanus, 1961, No. 2, pp. 37-44. 8 Charmion Wiegand, "Russian Arts", Encyclopedia of the Arts (New York, 1946), p. 874. 9 Paul Klee, "Creative Credo", in Will Grohman, Paul Klee (New York, n.d.), p. 99.